Governor of Borno State, Kashim Shettima, on Tuesday said the Boko Haram insurgency regained momentum after 2016 because of the failure of command at the theatre of war. 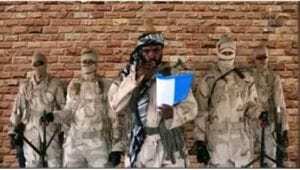 The Nigerian government had in 2016 declared that the terrorists had been technically defeated. Mr. Shettima said the change of guard at the Operation Lafiya Dole Theatre Command which saw the replacement of Leo Irabor, a Major General who is now at the Multinational Joint Task Force, did not help in sustaining the winning spirit of troops. Mr. Irabor was replaced by Attahiru Ibrahim, also a Major-General who has also been replaced with Rogers Nicholas, a Major-General. The governor said Mr. Ibrahim did not give a good account of himself as his tenure as Theatre Commander was greeted by embarrassing attacks on troops and civilians. Mr. Shettima said this when he hosted the ministers of Defence, Internal Affairs, Information and Culture as well as the Minister of State for Budget and Planning on a courtesy call to his office on Monday. The ministers, Mannir Dan Ali, Abdulrahman Dambazau, Lai Mohammed and Zainab Muhammed respectively, were in Maiduguri for a special town hall meeting on military operations. Governor Shettima said he was disappointed to observe that the previous commanders, who are from the southern states of Nigeria, did much better than the last occupant of the office who is from the north. “The last Theatre Commander who is even a northerner had woefully failed to perform,” said Mr. Shettima. He said the replacement of Mr. Attahiru with Mr. Nicholas, who is a southern Nigerian, was a game changer for the counterinsurgency operations. “When General Leo Irabor, another southerner, was leaving, he left the Boko Haram insurgents in their degraded state. But the insurgents picked up their hostility shortly after he left,” he said. Mr. Shettima said the recent victories of the military over Boko Haram were as a result of the change of guard at the Military command and control centre. “Some of our greatest accomplishments in the current counterinsurgency efforts were recorded under army generals who are not from Borno and northern Nigeria. “And what we have recorded in the last six weeks outweighs what was accomplished in the last three years, especially under General Nicholas who is yet another hero of our time. Mr. Shettima said the current tempo of the fight can only be sustained if the federal government doubles its support for the troops especially now that the rainy seasons are over. “We want the federal government to deploy more resources and sustain the current tempo before the rainy season sets in”, said the governor. “We need to root out the Boko Haram now before the now dry Sambisa forest becomes an impregnable fortress for Boko Haram”.